It’s about time I moved nearer to the present in articles about the past. There are all sorts of sites that itemise how rationing worked during World War 2, but I want to try and give an idea of how it felt to live in the period when ration books reappeared in 1939. It’s almost impossible after more than 70 years have elapsed to really comprehend their impact as our society has changed so much. Firstly, for women of that certain age, it wasn’t the first time these had appeared. Rationing came into force as an emergency measure during the First World War, when it was realised that we were in danger of running out of food as the German Uboats had paralysed shipping routes. So for these women a weary sense of deja vu must have come with the collection of their ration books. In 1939 rationing came into force immediately, but at the same time those who had been there before and could afford the expense stocked up as best they could on all the store cupboard goods they could get. This caused shortages very quickly, shelves emptied and an inflationary spiral began. The second thing that is difficult to appreciate is just how much our high street has changed, as indeed have our shopping practices. For most women marriage meant giving up work. It was expected that marriage was a full time occupation for most people, and without the advantage of today’s gadgets jobs like cleaning, washing and meal preparation all took far longer. Most middle class kitchens had a cool larder, but very few homes had refrigeration and freezers were unknown. Consequently shopping was virtually a daily exercise. Nowadays nearly every high street is unmemorable; the same chain stores peddling imported clothes and food are everywhere, and independent retailers are becoming a rarity – often forced out of business as they are unable to compete in the price war and economies of scale. However, back in 1939 we lived in a world where supermarkets were unknown. Meat came from a butcher, who more often than not had known the farmer who raised the animals and he would have bid for the animals at the live markets. He stood or fell by the quality of his butchery and his service. Likewise the baker (unsliced bread only) would have had his regular customers. 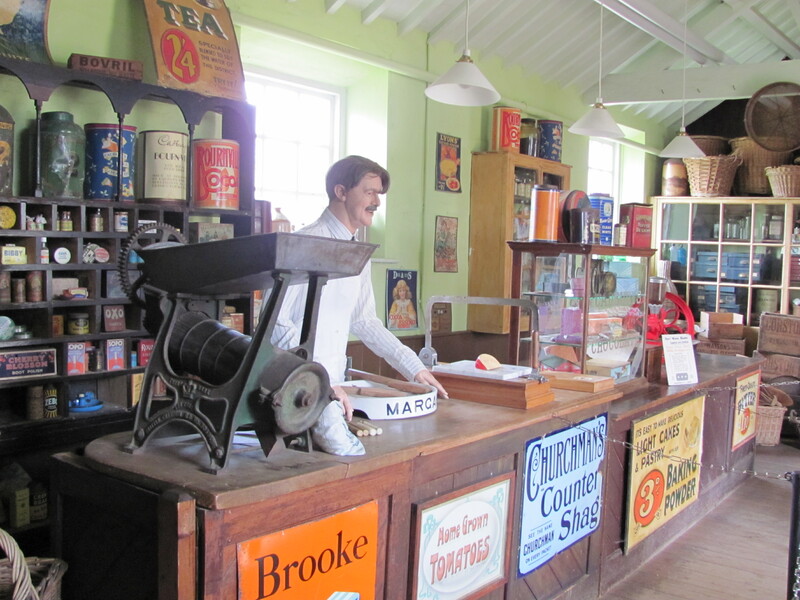 The greengrocer provided vegetables, the general grocer sold dairy products – butter, cream, (not yoghurt back then) cooked meats, tinned goods, biscuits. Cleaning products came from the hardware shop or ironmonger. This is the sort of general grocer’s at which everyone had to register when rationing started. Additional points for items like tinned goods could be used here. Today speed is of the essence: one whizz round a supermarket and the week’s shopping can be completed, clothes for school and leisure purchased, even luxury goods and toys get thrown into enormous trolleys. In 1939 shopping was a leisurely and more protracted affair, with customers stopping at each of the shops they needed and often knowing the shopkeepers by name – just as the shopkeepers knew their customers and their tastes. This is the lynchpin of why rationing worked all those years ago. Today if there is a shortage we simply go to another shop, secure in the knowledge that someone somewhere will have what we want. In 1939 everyone had to register with their grocer and butcher. They were then tied to that supplier unless they moved in which case they had to register somewhere else. Each time anyone made a purchase the tiny 1 inch square coupon had to be cut from their ration book – if the ration had been used then that was it. Other meals had to be concocted from things that were not rationed. It’s important to understand that many things were not rationed. Fish, for example, was never rationed but for many people it became impossible to obtain. Fishermen signed up to join the Navy or the Merchant Navy for the duration, and others were unwilling to risk the dangers of putting to sea. River rights were zealously guarded. Soon any slab of fish was a luxury to ordinary folk. Fish and chips (often mostly chips) were available wherever there was a fish and chip shop – the government thought about rationing this affordable treat but decided against it – but this was something for towns only, and they had shortages more severe than rural areas. Greengrocers were not affected by rationing either. In fact there was a welter of information advising the general public on how to make the most of vegetables, but there were still problems of supply. At the start of the war onions were mostly imported and became so scarce they became known as ‘white gold’. Tomatoes from the Channel Islands stopped when they were invaded by the Germans. All fruit and vegetables were seasonal, and had to be pickled, bottled and turned into jam when they were available – assuming that there was enough sugar and vinegar to go around. Game was not rationed either, so for those with grouse moors or deer parks meat did not disappear. However, all the staples quickly became scarce. Milk was in short supply as many dairy herds were slaughtered early on in 1940 so that the land they had grazed could be turned over to vegetable production. Meat was rationed by cost. Confusingly, some parts of the animal were not rationed, and favoured customers who could afford it might be offered rabbit or perhaps some offal; a heart, liver, a piece of suet or even a sausage or two made from those parts which were unrationed. Otherwise there was a monetary amount per week allowed – this varied according to time of year and what was available – so most people started to opt for cheaper cuts, giving them more weight, that could be stretched into as many meals (hashes, rissoles, pies and so on ) as possible. However, if younger members of the family were coming home on precious leave, then coupons might be saved to allow the purchase of a joint to roast. Short leaves for members of the forces were not given food rations, so family members had to make theirs go just that bit further. Butter, margarine, tea and eggs were all limited by quantity. At one point this was a miserable one and a half ounces each of margarine and butter per week. Alternative cooking oils which we use now were unknown. Olive oil was something bought in very small bottles from a chemist, and would stay like that until the 1970s. Sweets and biscuits became fond memories as factories switched their production to items needed to fight the war. Most of what was available, quite rightly, went to the NAAFI canteens to which only members of the armed forces had access. Daily newspapers became wafer thin. Packaging disappeared, and in the days before convenient plastic boxes were available, shoppers had to remember to take paper to wrap their precious twists of fat (not individually portioned, but sliced from a large slab by the grocer) and bits of meat. With shop windows heavily taped to protect against flying glass in the event of bombs, near empty shelves, no choice to speak of, and limited options for purchase shopping became a time consuming chore of trudging from store to store. Queueing became a national pastime with the added frustration of getting to the head of the queue only to find items were unavailable. The leisurely shop of the 1930s became a masterpiece of strategic planning: which one to go to first? Which one would have the most supplies? It was not unknown for women to join a queue just to see what they might have a chance of obtaining (Mass Observation details many shopping experiences from around the country). Today dress and appearance is relaxed, with jeans and trainers the uniform of most people. In 1939 it was customary to ‘dress’. Standards were important: hats and gloves were the norm when people went out. When clothes were rationed and prices simultaneously soared staying decent became an added chore. The hint that a chemist might have a little supply of lipstick would magically produce a queue of hopeful women. (Lipstick was an early casualty of war as the manufacturers turned to producing cartridge cases from lipstick cases and the fat was used in ammunition). Helpfully the government produced leaflets explaining how to use coupons to buy underwear one year, a coat the next and a suit – more versatile than a dress – the following rotation, but this was in the days before cheap clothing filled the streets. Most womens’ wardrobes were far smaller than today, and at the start of the war they had been exhorted to surrender any excess textiles they owned, including sheets, tableclothes and clothes to be used for the war effort. (Planes’ wings were fabric covered at the start of the war). Their initial enthusiasm to help the war effort meant that as the war years dragged on and things wore out they had no reserves with which to make new. Make Do and Mend entered the popular vocabulary. Yet more leaflets and posters bombarded women with advice on turning worn sheets sides to middle ( gives an uncomfortable ridge down the middle of the bed, but allowed worn sheets a new lease of life with frayed and thin parts tucked to the sides). Worn items of clothing were given new life with new cuffs, knitted collars, new waistbands etc. Knicker elastic and any trimmings were scarce but valuable trophies from a shopping expedition. Mothers with growing children were encouraged to clothes swap with others, or insert panels in tight clothes. Classes were established, where women shared their skills and prewar sewing machines with others. Other women joined the WVS, now the WRVS in recognition of their war work, and set up swap agencies for clothes: women could bring in outgrown clothes and exchange them for others. This had to be carefully regulated and there are accounts of unscrupulous women bringing in tatty rubbish, trying to get much better stuff and then selling it on. The WVS also provided an invaluable service in helping to kit out people who lost everything; sometimes even the clothes from their backs, in bombing raids. When houses disappeared in fire and rubble some victims also lost their documentation, and in the daze of shock and loss the WVS would be there with tea and sympathy as well as practical help and rest centres where women stood for hours serving tea and wads (sandwiches) to both bomb victims and the rescue services. Nowadays we think of the rescue services as professionals: trained and dedicated fire and rescue teams, but in the years 1939-1945 most able bodied men were serving in the forces. Teenagers, women and the more elderly took up voluntary firewatching and rescue duties. Incendiary bombs were a particular problem in this first ever war that targeted civilians as ferociously as the armed forces. A scatter of fires could devastate an area, and the bombs fractured water, gas and electricity supplies on a regular basis. It was impossible to keep up with repairs to minor bomb damage such as cracked walls, blown out glass and so on. Women living in areas that were frequently targeted spent long wakeful nights in semi underground and often damp Anderson shelters or communal refuges such as underground stations before emerging after sleepless nights to do punishing 12 or even 18 hour shifts at factories or other war work. Shopping had to be fitted around the remaining time unless a kindly and more elderly neighbour was there to help out. Everywhere and everyone was grey: exhaustion took its toll, as did the shortage of cleaning basics. Soap was rationed to 4oz per month. All the bathing luxuries we take for granted were either not yet invented or unavailable. Washing bodies and washing clothes all came from that 4oz of soap, and it was unpatriotic to have more than a greedy 5 inches of hot water to soak off the dirt. Lines were painted around baths to remind people that even in the bath we were still at war. Mid way through the war, as 1942 gave way to 1943, many people felt life could not get any harder. Rations were at their tightest. Christmas cheer was a hollow hope; presents if any were largely recycled memories from prewar days that had been tucked away in cupboards. Toys for children were swapped, made good and passed on. It is completely impossible in these days of relative abundance to imagine just how hard women struggled to make a memorable time for their families in an exceptionally cold winter. However, worse was still to come. The war ended twice: victory came to Europe in 1945 as allied troops finally converged on Berlin and news came through that Adolph Hitler was dead, but the ‘forgotten’ war that rampaged in the East continued through to August when the Japanese were finally stopped with the bombs of August 1945. There was overwhelming relief. A land ‘fit for heroes’ beckoned. People rang church bells and brought out the few reserves they had to celebrate together. For a brief time there was joy, and people expected things to get easier. The discovery that life was about to get even harder must have been just about the last straw to an exhausted nation, but it did. Throughout the war there had been penalties which included imprisonment and fines for wasting food, including stale bread (fines of ten shillings -50p – are recorded for this), but now, for the first time, even bread and potatoes are rationed. In fact everything that has been rationed continues; no relaxations, no freedoms. Our country had received millions of pounds in help from America through its lend lease scheme; some of the precious luxuries like tinned salmon and pineapple had been courtesy of this, but now came the reckoning as all this help had to be paid for. Rationing was to continue for nine years after 1945, almost twice the length of time that the war had lasted. In addition, women had to cope with huge changes to their lives. Their menfolk were demobbed, some home from POW experiences, some disabled and unable to work again. Children that had spent the duration as evacuees came home as strangers with different accents and experiences from their parents. Some children never came home – those that had been shipped halfway across the world to places like Australia. Women who had been holding down men’s jobs and experiencing economic freedom were expected to surrender this and return as if the war had never been. Yet on top of all this they still had to juggle the rationing books which varied in amounts available for adults and children, cope with the coupon system which governed clothes and grocery options, and be expected to be smiling and welcoming even if they no longer had a home to which they could welcome returning family members. This has tried to place the atmosphere of women’s lives on the Home Front. Obviously it is an overview, with experiences varying hugely around the country. For some rural communities the shortages were few and the pace of life not that changed, apart from the intrusive bureaucracy that accompanied growing food supplies. For others near starvation and constant exhaustion was the brutal reality. I haven’t even mentioned how women coped with loss – nearly everyone knew someone who had died, but nor have I covered escapism – cinemas, dances and concerts that brought relief from reality. The government of the time recruited ordinary people to chronicle their daily lives, and this ‘Mass Observation’ is an invaluable diary resource of fascinating details from around the country. For specifics of which foodstuffs etc were rationed and to how much, http://en.wikipedia.org/wiki/Rationing_in_the_United_Kingdom has the details in a tabled form. However, food coupons (as opposed to rations) were a means of applying a value to a range of items for which there were limited supplies, and these varied from time to time. It was a means of allowing customers a limited amount of choice in what was available and spreading it around. Thus, for example, food coupons might buy a jar of invaluable vegetable extract, or if a birthday was due, it might go on a tin of fruit, salmon, or perhaps some dried fruit for a cake made with dried egg. It is perhaps worth remembering that we were not alone in our shortages. As a child I remember being shown a bare rocky ledge at the seashore in the Channel Islands. Some forty feet out the limpets clustered together for the first time. When I asked why I was told, ‘That was where we had eaten to when the war ended. We had nothing else’. In Guernsey a German boy soldier of 16 was shot as an example because he was caught desperately looking for anything he could eat in a bin. In Holland as war came to an end in Europe, the Pathfinder bombing teams under Arthur Harris worked around the clock dropping emergency food supplies to the starving people over there. In Germany the rationing system for civilians was remarkably similar to ours, except that where we bewailed the shortage of tea they desperately searched for alternatives for coffee to keep themselves going.